NEW YORK, NY, September 20, 2018 — Promos agency releases the program “Bring your projects in front of people” for NGOs that need to communicate their projects to people who are interested. They found out that the NGOs have many cases to support, but they have limited resources to bring them in front of the interested public. There are many people who can help NGOs but they don't know about existence of projects because they are not advertised. The easiest way to advertise a project is through the online, because most of the people use it and they have access to information easily. The NGOs projects that follow objectives such as: donations, attracting volunteers, education and others, are supported by Promos agency by offering free support for communication of the projects. Platforms such as Google and Facebook offer grants for NGOs. This platforms brings at your disposal a budget for communicate your projects. The NGOs are dedicated to their cases and focuses all its actions towards finding a solution to solve them. The rising of the funds for the necessary activities is a difficult task and some NGOs do not find sufficient funds to communicate their vision. There are organizations that have in their structures people that are responsible for communication to the targeted public, but for the smaller organizations that do not have a person responsible for this activity is difficult to bring their projects in front of the people. Through this program, the agency wants to be involved in the activities that make a good impact in the society. Any NGO that needs help to communicate their projects can contact Promos Agency at [email protected] and in the shortest time their will receive an answer regarding their request. 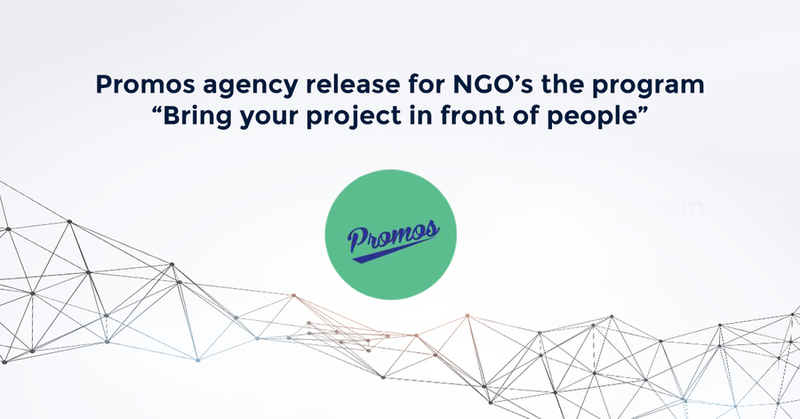 Promos is an advertising agency who want to help NGOs to communicate their project to interested people. We have expertise in online digital marketing and we want to use it for society.